When herbs are in full bloom, we take our fragrant clippings straight to the cocktail glass. Inspired by some of our favorite bottled herbal liqueurs, we developed a recipe that combines a bouquet of fresh herbs with a spiced honey syrup for a quick and easy homemade version. Blitzing the herbs in a blender eliminates the need for a lengthy infusion time, while the simmered cinnamon syrup provides just the right amount of sweet heat. But the best part? 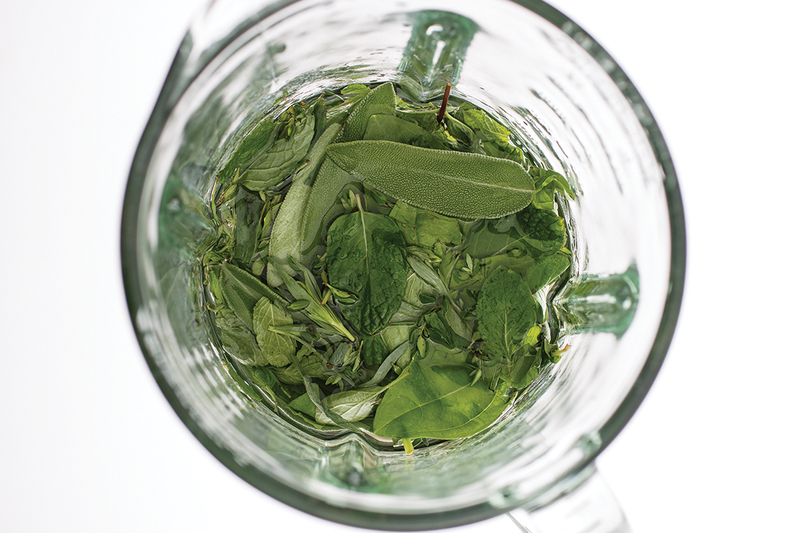 This formula is adaptable to the whims of your own tastes, so feel free to mix and match fresh herbs and botanicals. Sip it on the rocks or with a splash of soda, or in our lemony riff on the Last Word cocktail, the Final Say. 1. De-stem all the herbs, reserving the leaves and discarding the stems. 2. Combine the leaves with the vodka in a blender. Blend on high for 1 minute. Set aside. 3. In a small saucepan, combine honey and water over high heat. Break cinnamon stick into large pieces and add cinnamon and nutmeg to the saucepan. Bring to a boil, then remove from heat, cover and let cool to room temperature. 4. After the syrup has cooled, remove cinnamon pieces and add spiced honey syrup to the vodka-herb mixture in the blender. Pulse several times to combine. 5. Line a funnel with a single layer of a clean kitchen towel. Strain mixture into a clean glass jar. Let rest several hours and repeat strain, if desired, leaving sediment at bottom of jar. TIP: We prefer our herbal liqueur with some of the solids still intact, hence the single strain. If you prefer a clearer liqueur, strain the batch through a coffee filter before bottling.